Interfaces are a powerful way to remove code dependencies and as a result allow to better tailer code size to feature use. 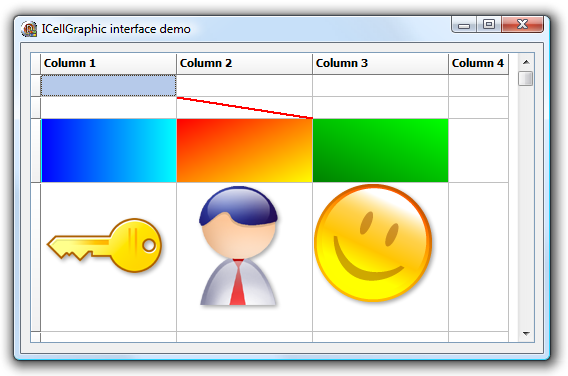 In TAdvStringGrid it is possible to add an interfaced object to a cell and have the interface paint the cell. This way, all kinds of small or large code can be used to paint a cell without forcing any user who is not interested in a particular graphical feature in the grid to link the code. The first method Draw() is called to draw the cell Col,Row within rectangle R on the canvas Canvas. An extra parameter Selected indicates the selection state of the cell. Two functions return the desired size of the graphic in the cell. These functions are used for autosizing in the grid to adapt the cell size automatically to the size of the graphic. A function IsBackground is used to inform the grid whether text still needs to be drawn on top of the graphic or not.